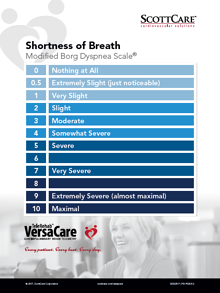 The Rating of Perceived Dyspnea (RPD) Scale helps your cardiac rehab patients identify the amount of shortness of breath they are experiencing during their exercise regimen. After you download your poster (English and Spanish versions will be accessible), we invite you to learn more about TeleRehab™ VersaCare, our multi-parameter telemetry solution with integrated program management and outcomes, mobile functionality and seamless EHR integration. For even more details, register for a free live demo of VersaCare. Hanging this popular poster in clear view of your rehab patients will help guide them during their exercise regimen.